Fly-half Geraghty made his England debut as a replacement against France in the 2007 Six Nations - carving through the French defence to create a crucial try for team mate Mike Tindall and kicking a penalty and a conversion in the 26-18 Twickenham triumph. A long-running hamstring injury would plague his career over the following months and it returned in his comeback game for England Saxons against the United States in the 2007 Churchill Cup. Recurrences of the injury would see him ruled out of that year's Rugby World Cup in France. He battled more injuries including a broken hand before battling back to eye-catching form - claiming the man of the match award in the Saxons' 31-13 victory over Ireland 'A' in early 2008. But having been drafted into Brian Ashton's squad for the Six Nations clash his injury curse struck again - this time a knee ligament injury ruling him out for eight weeks. Equally at home at fly-half or inside centre, he was named in Martin Johnson's England Elite Squad in July 2008 but an ankle injury hampered his preparations for the 2008-09 season. Although not selected for the end of year internationals, by the end of the year he was back to his best form and pushing for more England honours alongside a promising generation of young fly-halves including Danny Cipriani, Toby Flood and Ryan Lamb. In 2009 he made his debut for Northampton Saints, leaving his long-time club London Irish for Franklin's Gardens and immediately hitting a promising run of form despite alternating between centre and fly-half. However, he continued to be overlooked by England boss Martin Johnson at senior level and was repeatedly consigned to the Saxons squad. After two years with the Saints, Geraghty opted for a move to the Top 14 where he joined Brive. After finding himself in and out of the first-team, Geraghty announced that he would re-join London Irish ahead of the 2012-13 season. At times, he may have questioned his decision to pursure a career with England given that he had represented Ireland at Under-16 level. Still, he subsequently went on to represent Engladn at every age-group including the 2005 IRB Under-21 World Championship in Argentina. His career had started at Colston's Collegiate School in Bristol. 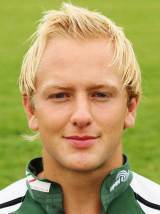 He then joined the London Irish Academy in July 2004 and made dramatic progress to the extent that he was invited to join the England National Academy after a year where he benefited from the individual coaching of Jon Callard and Brian Ashton.